Dachshund Rescue South Florida hasn't added a story. A rescue blast went out from the shelter... “Rescue needed. Humane euthanasia recommended at 4PM” He was suffering from neurological symptoms and his eyes pleaded from the shelter photo for a chance. We couldn’t let him down We had to give it to him. A rescue Hold was placed just under the wire and DRSF Transporter Margaret made herself available to be his freedom ride. We named him Spock and Southeast Veterinary Neurology was on alert that we were en route and needed their help. Dr Peress was waiting on their arrival to take Spock back for an evaualtion and assess his condition. We are back again to ask your support to give hope, a 2nd chance, and quite literally the chance to live. Spock didn’t have anyone and now he has DRSF and now we need you to make sure we can be th safety net for Spock AND for the next little One we know is right around the corner. As always, every dollar counts and even if you are not able to donate, your comment alone supports Spock as the more comments we have the more people see our dogs stories!! 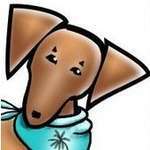 Dachshund Rescue South Florida hasn't posted any updates yet. Dachshund Rescue South Florida is managing the funds for this campaign.